Lately I’ve been in a “stuffing various ingredients into bread” kind of mood. 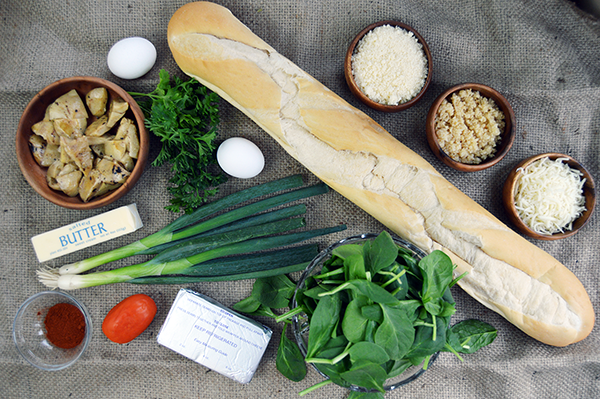 Whether I’m stuffing cheese into a pizza pretzel or filling a loaf of ciabatta bread with chicken and artichokes, there is no shortage of ingredients that taste amazing with bread. Filled with fresh ingredients like spinach, cream cheese, tomatoes and artichokes, then topped with garlic butter, parmesan and green onions - there’s really no competition when it comes to how amazing this stuffed garlic bread actually is. Plus, it’s simple to make for any type of event or for a quick weeknight dinner. Now garlic bread is one of my favorite foods that I just cannot get enough of. 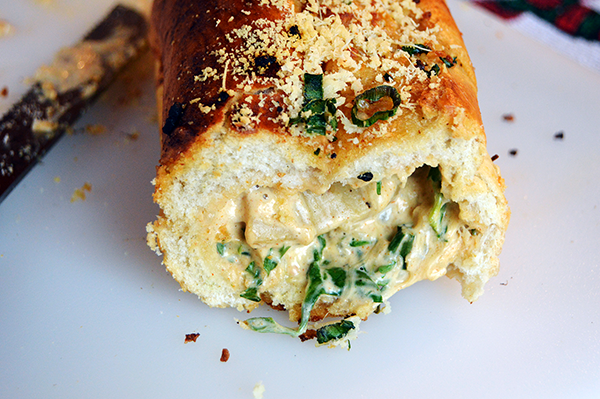 Around Christmas time when I first attempted to stuff a loaf of bread with cheese and chicken, I realized that this method of filling a bread tube with deliciousness was way easier than I had originally anticipated. I have made several stuffed loaves since then, but this one turned out to be my favorite. 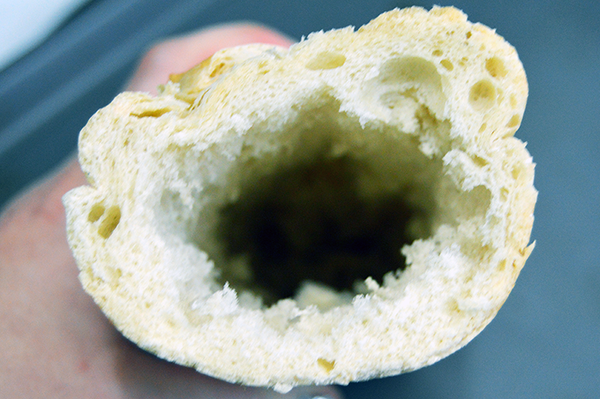 Begin by hollowing out the French bread. It’s easiest to do this by first cutting the bread in half, and then cutting each half in half again, then using a long knife to loosen the bread from the crust and remove it by hand. The bread should be hollow but still have the end so there’s less of a chance of the creamy goodness contained within with melt out when cooked. In total, you should have two hollowed bread tubes with ends, and two without ends. Feel free to use the extra breading in a nice strata. 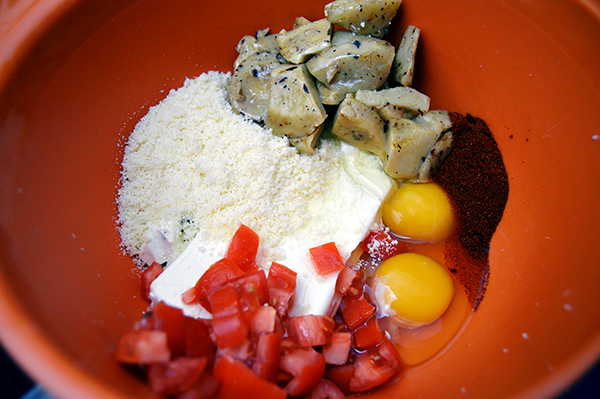 In a small bowl, stir together the cream cheese, artichoke hearts, tomatoes, grated parmesan cheese and paprika. 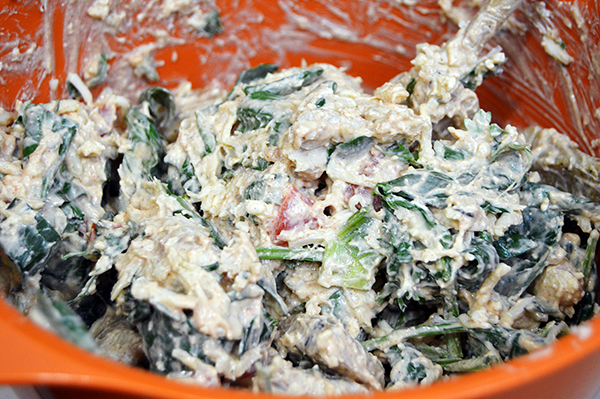 Then fold the spinach into the cream cheese mixture. 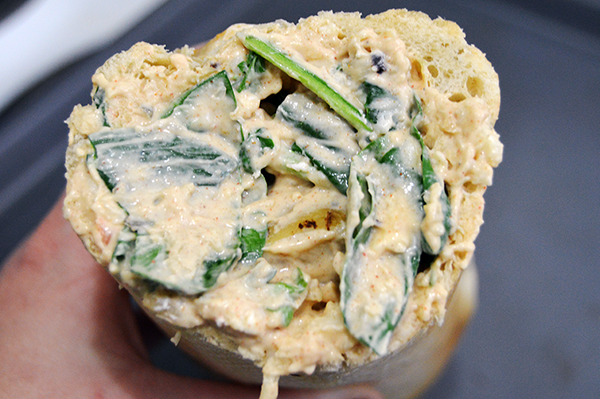 Chop up the parsley and green onions and use half of both in the cream cheese filling. Add the spinach, then chill until ready to fill the bread tubes. 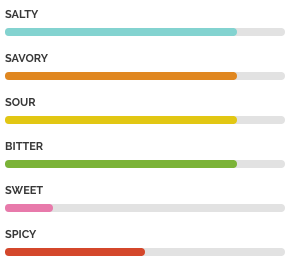 I let mine chill for about an hour to really bring out the flavors. Next, stuff the bread tubes full! You can fit a surprising amount of filling into each half of the french loaf, especially if you bought one of the extra long kind as I did. Try to fill the bread to capacity without splitting the sides. It’s even okay if the top is mounded off instead of flattened, since you’ll be pressing the two ends together while cooking anyways. Use a cake pan to hold the bread while it cooks. I used a 9x13 cake pan and arranged the bread so each half fit within the pan. Press the ends of the breads together so the filling meets and makes the bread stick. I also pushed the open side of each half of the loaf against the side of the cake pan to prevent much of the filling from escaping that way as well. 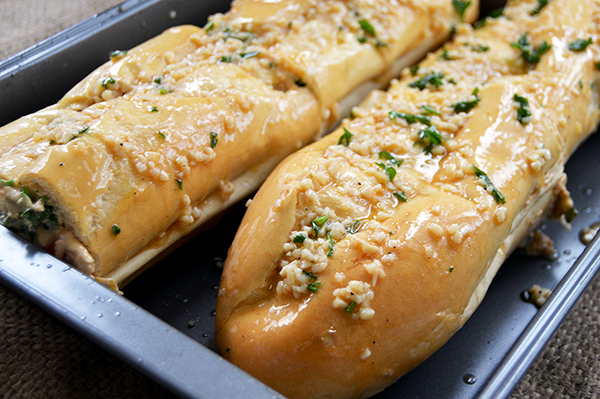 Brush each loaf with the melted butter and garlic mixture, then bake until the tops of the bread are golden. 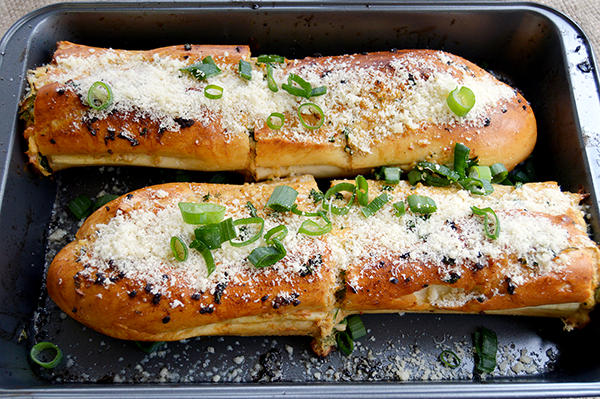 Garnish the loaves with any extra parmesan cheese, parsley and green onions. I recommend letting the bread cool for several minutes before attempting to slice it. We reheated ours after traveling with it, chilled, to Nick’s parents house and then promptly sliced into it without waiting for it to cool - that could possibly be why my pictures make the bread look so smashed, but I assure you, the second loaf that we cut later (and I neglected to get pictures of) looked much, much better. 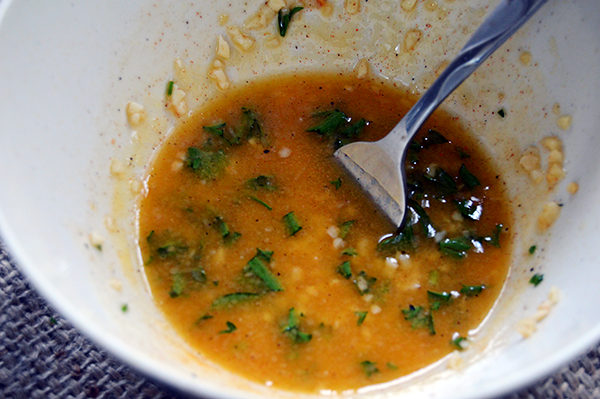 And everyone in the family was absolutely raving about it, so here’s the recipe for ya’ll! Preheat the oven to 350°F. Cut the loaf in half, then cut each half in half again. Use a long knife to cut around the breading to remove it from the crust. Reserve bread ‘insides’ for another recipe. In a medium sized bowl, stir together the cream cheese, eggs, tomato, and paprika. Add half of the green onions. 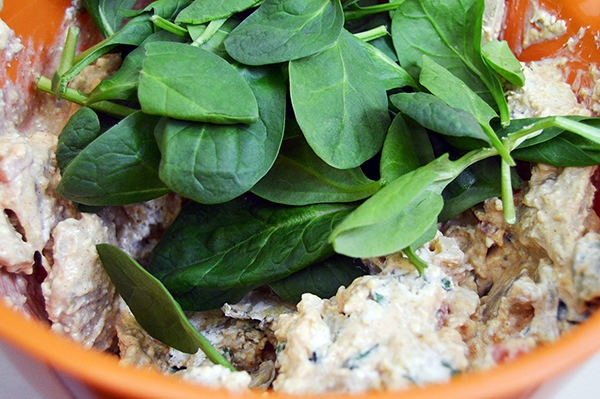 Fold in the parsley and spinach. Spoon the filling into the hollowed out bread until no more can fit in the loaves without splitting the sides. Press each half of the loaves together then place into a cake pan. Press the open end of each loaf against the side of the pan to prevent the filling from spilling out while it cooks. Melt the butter in a small bowl with the garlic until the garlic is fragrant. Brush the butter and garlic mixture over the bread. 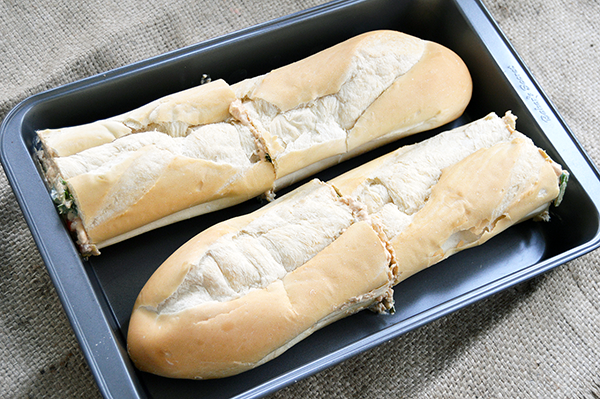 Pop the stuffed bread into the oven and bake for fifteen minutes, until golden brown on top. Garnish with the remaining parmesan cheese and green onions. Wait to cut for at least twenty minutes, to let the filling set properly. Serve warm, room temp, or cold and enjoy!